That looks like a great parabolic cooker, very nice looking! Very impressive! I think it's great that you can manufacture your own and have them turn out so well. We would love to hear about and see more of your solar cookers that you have made. 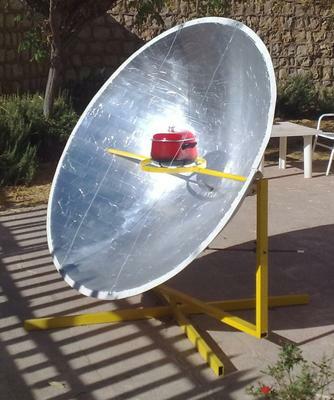 It would be inspiring to other people to see that it is quite feasible to make their own solar cookers. That is a great site you have on Facebook. Very good and well written and illustrated information on alternative energy projects and products of your own design. i have produced small portable solar cooker 40 cm diameter. Dear Sir-Madam, the best thing you should do to get better results from you own solar cooker is to paint the receptacle with mat black painting to absorb the heat.